In Fričovce, you can easily glimpse the Renaissance mansion, which was built between 1623-1630. The mansion Fričovce is unique for its figural and vegetal ornamental sgraffito embellishment, created by the artist Martin Waxman. He applied two-colour sgraffito technique, using ivory and gray black carbon. When looking at the sgraffito embellishment, you will notice that the heads of the figures are bigger than their bodies: the artist applied the principle of vertical perspective of the viewer from bottom-up. About 150 historical and mythological figures adorn the attic of the mansion. The choice of characters is miscellaneous and represents antique gods, along with iconic figures of human virtues, figures of antiquity, Hungarian and Polish history scenes, among others. A gallery of ruling emperors of the Roman Empire and famous people of Hungary have been portrayed by the artist on the front facade of the mansion. From kings to Sultans you can sight the General Ján Zizka and the Sultan Amurat. 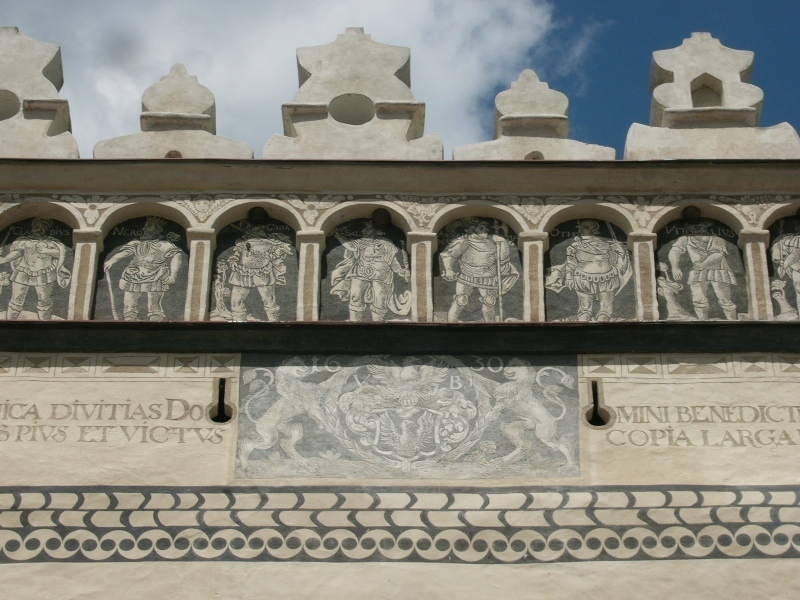 The sgraffito coat of arms of Berthoty family (heraldic shield with eagle and the royal crown) is still preserved in the front facade of the mansion Fričovce.